The third part of our "Crunch" series is brought to you by our friends over at Three Rivers Running Company. If you have more questions or thoughts, stop in, they'd love to talk with you! Running/jogging has become more popular over the last few years. Including everything from Couch to 5k programs, Color Runs, Zombie Runs and the biggest Half Marathons around the country. Some people don’t classify themselves as runners, but if you’re moving and there is a split second that both feet are off the ground, you’re a “runner”. The beauty of running is that most runners are very supportive of other runners, no matter the ability level. The hardest part for many of us is how to find the time to crunch running into our crazy lives? This question can be answered by identifying the things in our lives that are priorities and include running to that list. If you don't prioritize your run, you may never make it out the door. Half the battle is deciding on whether or not to take the time to lace up the shoes or just continue on with what you are doing. Setting goals, keeping a flexible routine, having an accountability partner and having fun are the some of the big things “crunched” runners can do to stay on track. Goals can be set as short-term, long-term or even daily, if needed. It could be finishing a 5k, trying to beat your best half-marathon time, reaching a distance you've never gone before or running stay in shape physically. Without setting some type of goal, you’ll find yourself with excuses that come between you and your run. Routines can bog people down, making workouts boring and no fun. Don’t let missing one workout spiral things out of control for the week. After all, it’s only 1 day. It takes much longer than that to lose what you've worked so hard to gain. Switching the days in which you run depending on how you feel can turn a good day of running into one of the best workout sessions. It’ll keep you from having to try to bury yourself in the ground on a day where your legs just don’t feel like going hard. Being flexible with your training can make a world of difference in how much you enjoy running. Also, it will keep you from making running too important in your life. Make time for yourself, family, friends in this schedule as well. You must find the balance as you walk the fine line of flexibility and structure. Too much flexibility and nothing gets done. You have to decide for yourself, what can be sacrificed and what can’t. Training or workout partners can make a world of difference. You both have something in common: lives going on outside of meeting. Taking the time to meet someone can be huge for both of you. You start becoming accountable for your goals that you share with each other, too. Training/workouts become easier with someone doing the same thing. Of course, it is okay to run on your own, too. You must find what fits your schedule best. FUN! Why did we all start in the first place? If you didn’t enjoy running to begin with, would you have continued? Go out for a run with someone that you've never run with before, even if they are slower than you. Talk with them and see how they started running and share your running stories. If you have kids, run with them if they want to run with you. 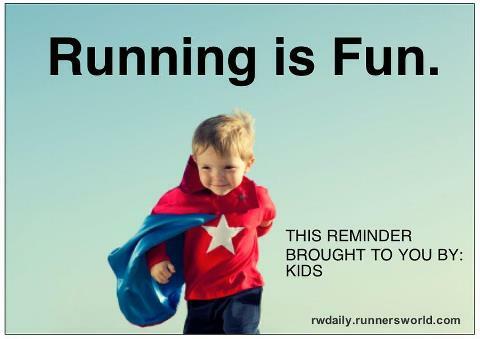 If you’re a running family, do a race together. Plan a trip to a race with some of your running buddies or partners. Get involved with a group. There isn't a right or wrong ways to go about running. You must do what works for you, and go for it! Put one foot in front of the other and enjoy the path. These are some tips on how to “crunch” in time for running with all of our crazy lives. If you have anything to share with your fellow runners, feel free to share your insights.